Bulk purchasers of RCRA biochar soil amendment products such as Carbon8 or Deco-Carbon can claim a Sequestered Carbon Certificate of Authenticity. This certificate should be filed with the property papers of the property where the biochar has been applied. RCRA Sequestered Carbon Certificates of Authenticity are a proof of application permanent record of how much sequestered carbon a purchaser has applied to their property. In the future these certificates can be used as proof of improved land quality and could feasibly draw an increase in land value. These certificates can also be used to prove compliance for certification for Carbon tick foods ratings. 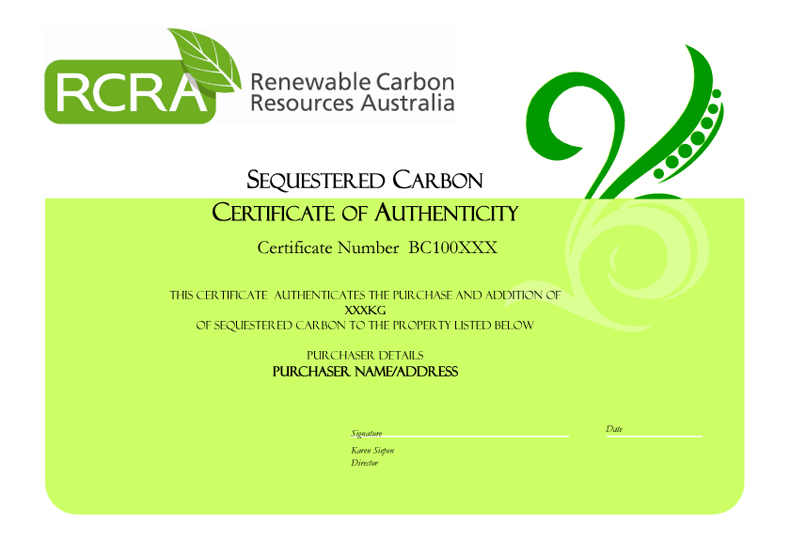 If you have purchased RCRA biochar products in 1cubic metre quantities or larger but do not have a certificate of authenticity, please contact karen@rcra.com.au.